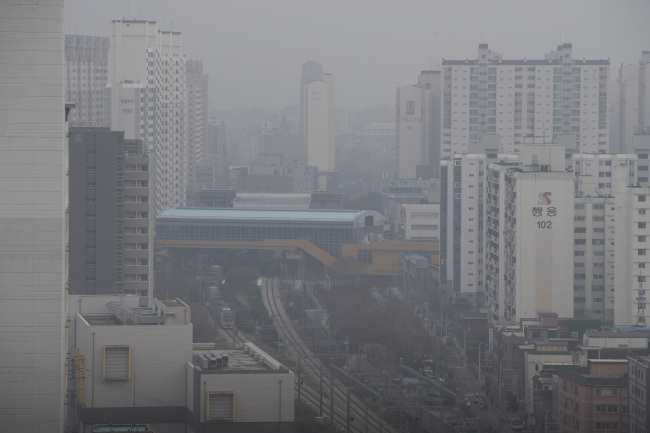 Local governments of South Korea and China on Tuesday agreed to deepen bilateral cooperation to tackle the deteriorating air quality of the two countries. Mayors and governors of seven South Korean local governments -- Seoul, Daegu, Sejong, South Chungcheong Province, South Jeolla Province, North Gyeongsang Province and Jeju Province -- met with heads of 10 Chinese provinces and metropolitan cities in Beijing to discuss boosting their bilateral exchanges in wide-ranging areas, including climate, the environment and tourism. After the second such gathering between the two countries, the local government leaders are to adopt a joint declaration calling for expanding bilateral cooperation to improve their countries' air quality. The two countries held the first conference of provincial governors and mayors in Incheon, South Korea, in 2016 to help stimulate bilateral cooperation and exchanges. At Tuesday's meeting, the mayors and provincial governors also agreed to step up cooperation in tourism and humanities exchanges through a combination of sisterhood agreements, traditional festivals and sports events. "It is the first time that local government heads of South Korea and China have agreed to jointly cope with climate change," said an official from the Seoul Metropolitan Government. After the meeting, Seoul Mayor Park Won-soon and other South Korean delegates plan to meet with Chinese Premier Li Keqiang. South Korean provincial governors and mayors are also expected to use the Beijing conference as an opportunity to attract Chinese capital and tourists and sign additional sisterhood agreements, according to officials involved in the meeting. The meeting came after years of conflict over the deployment of an American missile defense system, named THAAD, in South Korea. The municipalities of Seoul and Beijing held a joint forum on climate and environment cooperation in the Chinese capital on Monday and agreed to jointly study ways to reduce fine dust in the two cities. Jeju Gov. Woo Hee-ryong introduced his province's "Carbon Free Island 2030" project, which calls for securing all electric power from renewable energy and replacing all cars with electric vehicles by the target year to build an "island of energy independence."